As some of you may know, i am not a true Belgian. I was born and grew up in Germany and moved to Belgium for university and my now hubby. I really love Belgium but sometimes i do miss the country i grew up in and most important my family. So, while a busy life and work keep me from returning often, i try to go atleast a few times per year. Especially once per year, me and my sister meet for a day just for us. Then we can catch up and talk about things, just sisters can talk about. So while i recently enjoyed one of these days in Cologne (the city my sister lives in), we did quite some credit card damage and went shopping. Cologne is a great place to shop since it offers something for any taste or wallet. Beside the numerous special little stores which you just will have to discover on your own, i have a few stores, i always have to stop at to fuel my beauty addiction. I work together with quite a few expats, so i have been asked numerous times to give them a mini shopping guide when they went off to Germany. And well i thought, why not share this with you. Quite some of the shops i describe here you can find also in other german cities, so this tipps can be used for really any German city you like to visit. When you arrive in Cologne by train (or at the airport and then take the train), you arrive at the center of the cologne at the foot of the Dome. This building is incredible. I can just recommend to make a stop here because it will blow your mind. The dome is said to contain the bones of the three magi but is by itself alread a miracle of a building. If you go from the station, up the stairs and arround the dome you will be heading towards the Hohe strasse. When i arrive by train i like to make a quick stop at the bakery Merzenich. In Germany, bakeries are often places where you can sit down, have a breakfast and coffee or enjoy a delicious piece of cake. They are also very affordable. My husband has become addicted to those. In the Hohe strasse you will find all the well known stores you can think off. Beautywise, this is where you find DM, Kiko, Douglas, Lush and Galeria Kaufhof. But okay, if you are not german, some of those might not mean anything to you. I will skip Lush and Kiko since i think you all know and love those. Lush is by the way in Germany less expensive then Belgium but pricier then England. Kiko is as cheap as everywhere and they have a great little store where you can test your way through their product lines. DM: DM is a drugstore. Think superdrug but the german version. I love love love DM. They have one of the best house brands ever. German beauty bloggers go regulary nuts over the DM housebrands like Balea, Alverde and P2. Those products are extremely good quality, good ingredients but with unbeatable prices. Obviously you will find also a lot of the known drugstore brands here like Max factor, L'oreal, Maybelline etc. With one big difference: They are partially a lot cheaper. Sometimes even a few euro difference. The most shockking example was for me the Essie nail polishes which cost 8 euro, while i pay in Belgium up to 14 euro. One secret tip: Manhattan. I noticed that i could not find any Rimmel products in Germany. However, Manhattan had some products which were extremely alike to some of the famous Rimmel products. So when i googled the company, it turned out that they belong to the same mother company. They do not look exactly the same but the similarity is undeniable (check this link for a very good example). However, they come for a fraction of the price. E.g. i paid for my manhattan wake up concealer (cough* rimmel wake me up concealer*) 2,50 Euro. I tried quite some of their products by now and they are honestly exactly the same. One last tip, before this turns into a DM only post: Give bebe beautycare a chance. This company used to produce products for babies. However, when those babies grew older and still loved their products, the released a bebe young care line, aimed at teenagers. Most recently, they released bebe more for the ones, not quite teenagers anymore. I grew up with this brand and i love love love the scent and its does amazing things for my skin. I have to by now, regulary bring some of this for people in Belgium. I heard DM will start a webshop soon, so keep your eyes peeled. But okay, enough DM. Just go there, thank me later. Douglas: Douglas is basically the German Space NK or Sephora. Here you can buy high end make up and perfums. Here you can find brands like Smash box, Jo Malone, Bobby Brown, Dior, Clarins, Laurah Mercier, Lancome, Clinique, Dermatologica etc. Here you also find Benefit and Soap and Glory (however, soap and glory is a bit pricier then in britain and its a limited collection (e.g. no make up). You will also find a Mac counter here. Usually there is always something going on in the store like free skin consultations, make overs etc. In cologne they also have a benefit brow bar in the Douglas. The one in the station also has an impressive NYX display. This is comparable to the Galeria Inno in Belgium, if you should be familiar with it. Galeria Kaufhof is a department store. They sell clothing, homeware, delicatessen but also beauty and makeup. One thing i like to mention specifically about the one in Cologne is that they have a Kiehls counter with the most darling parisian expat. We ended up having a lovely chit chat about our favourite Parisian stores (he knew somebody who worked at Huygens). Like at all Kiehls counters, they are super helpfull and give great advice and let you test anything. TKmaxx: I would be a liar if i would say that i like this store. I actually dislike it. Its usually way to full and very confusing. This store is jam packed with rest stocks of clothing. Nothing is sorted and most of it is not my taste. I guess if you have infinite patitience you could find some great offers here but it is not for me. However, the reason i am coming here is the beauty corner. Not only are there often some great deals, but also some brands i cant get anywhere else. You will have to search yourselve through a pile of bottles but i found here the most darling little french soaps and some bath milk from The scottish soap company which i had never seen outside britain. I also found here already Philosophy, Tigi bed hair, ciate etc. Deichmann: Yes i know, this is not a beauty store but i cannot possibly leave that one out. This is a shoe store. Better to say, this is THE shoe store. Even my hubby which is usually pretty posh when it comes to clothing, fell in love with this affordable shoe store. You will find cheap and less cheap shoes here, but all of them are good value for money. I spend in my life a considerable amount of money on brand shoes and i can tell you that the Deichmann shoes are up there with many of them. Very comfy and durable and with a great variety of styles. I usually walk out with 3-4 new pair of shoes (tip: their ballerinas are the most comfy shoes ever). 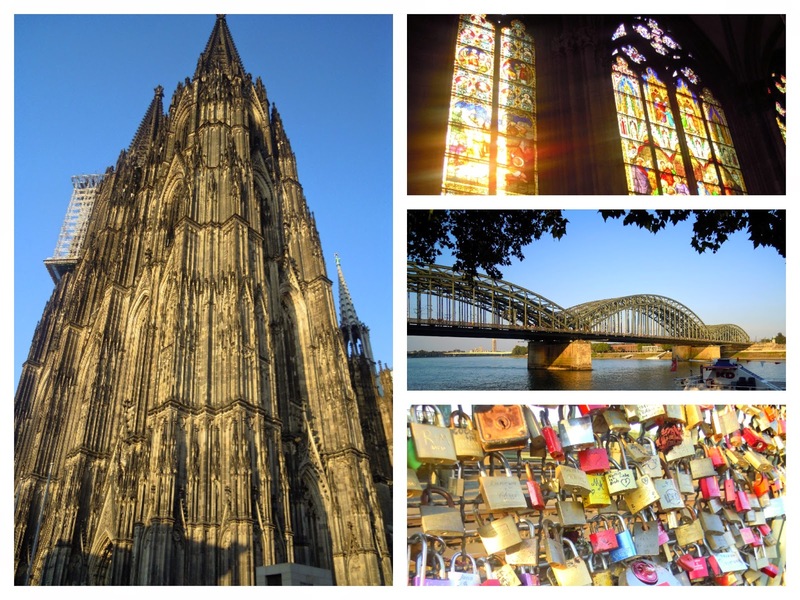 I hope you enjoyed this little guide for a quick beauty shopping trip in Cologne. If you have any more questions regarding shopping in Germany, shoot away. Also if you should be interested in a sightseeing or food guide for Aachen, Cologne, Duesseldorf etc. Let me know. And in case you wonder what i all bought in Cologne: Well way to much and not enough. But there will be a haul post up soon :). Yes, I missed Rimmel here in Germany and wondered why the Manhattan foundation is in the same bottle, just the colour of the lid is different. Oh and Deichmann... I love the shoes there, great quality for little money. I have yet to force myself to accept that I am not in London anymore, but in Cologne... it's hard but it's only for two years maximum. Great post!! Next time I go to Germany I'll be sure to visit some of the places you've recommended!